The first pillar of the central bank narrative is the well-known claim that interest rates are the main tool of monetary policy. This narrative is backed by the familiar theory that, ceteris paribus, lower interest rates will stimulate economic growth and higher interest rates will slow growth. Thus by lowering rates, central banks accelerate growth and by raising rates, they slow it, allowing impressive fine-tuning of the economy. Hence the central bankers’ constant obsession with minute changes in interest rates that are said to have the power to rattle global markets and, consequently, are dominating the media coverage of central bank actions as if they will stand out in sharp relief in any future account of the history of mankind. Markets are in equilibrium, thanks to price movements that have equated demand and supply. The interest rate theory is in turn backed by this second pillar of the central bank narrative: Market equilibrium. This equilibrium which markets are said to be usually found in, is a state of effective resource allocation that results from virtually automatic or ‘natural’ price movements which ensure that demand equals supply almost all of the time. These price movements not only create pervasive ‘general equilibrium’, as economists and central bank models assume, but they also ensure that it is sufficient to focus on prices when conducting economic analysis, since prices lead (generating the equilibrium) and quantities fall into line. Hence policy should focus on prices. This logic is consistently applied across markets, including the markets for money and credit, which are said to be dominated by their price (the rate of interest). As a result, the first pillar of the central banking narrative is justified: what else but interest rates should one use as policy tool in such a world of equilibrium and the dominance of prices? Banks are just financial intermediaries, like other non-bank financial firms. They thus do not need to be singled out in the analysis or modelled explicitly. The third pillar of the narrative further tidies up the analysis by following through on the dominance of interest rates when it comes to financial institutions: While ordinary mortals might have the naïve belief that banks matter for the economy and could indeed be powerful – or even be the key agents of change or influence – central bankers and their hired neo-classical theorists know better than that: banks are mere financial intermediaries, transferring existing savings from depositors to investors, just like non-bank financial intermediaries are doing. In other words, banks are not special or different from other financial firms, and hence they do not have to be singled out in economic models – which explains why economists and all the major central banks have indeed failed to include banks at all in their economic models for the past 40 years. (This was a little embarrassing, when the 2008 banking crisis hit, but the central bankers and neo-classical economists are hoping you have already forgotten that). We need to save in order to fund investments that are the precondition of economic growth and development. If domestic savings are insufficient, we need to borrow from abroad or attract foreign investment. The fourth pillar of the central bankers’ narrative has been the claim that nations that would like to develop and grow the economy need to accumulate scarce savings first, in order to fund the necessary investments. To attract these scarce savings, interest rates are needed, linking into claim 1. Moreover, since many developing countries were seen to have insufficient savings, the central banking narrative maintained that they needed to borrow the necessary funds from abroad. Thus it was fortuitous – if not serendipitous – that at the very moment when the developing countries had been educated into understanding their need of foreign borrowing, it just so happened that foreign bankers stood ready to engage in this selfless task. This need to borrow from foreign bankers has been the basis for postwar IMF and World Bank policies that drove home this point with developing countries over the past decades – if, that is – and this is a major caveat – they were in possession of attractive assets, such as raw materials and resources that are needed by industrialised countries. (Notice that countries without attractive assets never got into debt, because nobody would lend to them in the first place; likewise it was always a little curious that the global financiers at JP Morgan and other big global banks, the world’s experts in the latest derivative instruments, genuinely believed that developing countries like Ghana or Sudan were in fact much better at managing foreign exchange risk than the top teams at JP Morgan – for why else would the global bankers insist on lending to the eveloping countries in foreign currency, leaving any hedging to their exposed customers?). Both the foreign investors and the domestic goal of high growth require deregulation, liberalization and privatization, since only in such an economy can market forces deliver high and stable growth. The final pillar of the central banking narrative is that economic growth requires markets to function in an unimpeded fashion, not held back by such barbarous relics as regulations and government intervention. Hence the mainstay central bank advice – or demand – directed at the governments to deregulate, liberalise and privatize, while generally adopting a laissez-faire attitude: no matter how big and influential a small number of multinationals or mega-banks get, their lobbyists are probably aiming at general public welfare and so their good work should not be hampered through unnecessary red tape or restrictions on their activities. We are all familiar with parts or all of this central bank narrative, even if we are not trained economists or not commonly interested in economic issues: This is because this narrative has been repeated ad nauseam hundreds of times in the past four decades. As a result, even astute observers assume that empirical research has long established these five insights from the central bankers, in uncountable meticulous quantitative research studies. But this is not the case. The truth could not be further from it: There is in fact no empirical evidence to support any of these five claims. They are mere assertions. Claims that have, in fact, been disproven by the facts. There is overwhelming evidence to the contrary, and this has become increasingly obvious since the 2008 financial crisis. While voices of those pointing out that the central banking narrative has been wrong (e.g. Werner, 1992, 1994, 2003a) had been successfully drowned out by central banks and their large-scale and meticulously planned PR campaigns for many years (see Ishii and Werner, 2003; Werner, 2003b, on the ‘information management’ of central banks), it is now becoming apparent and visible even to laymen that the central banking narrative has collapsed on all fronts. Consider first the claim that banks are mere financial intermediaries that have no special powers. For a whole century, central bank-sponsored researchers had been obfuscating the issues, claiming that either the fractional reserve theory of banking was correct or, for the past 40 years, the theory of banks as mere financial intermediaries. Despite an ongoing controversy among experts on this issue, it never occurred to economists – used to mainly dealing with theoretical dream worlds of their own making – that the methods of scientific research could in fact also be applied in economics, i.e. a suitable and careful empirical test could be conducted to settle the question of the role of banks once and for all. In 2014, the first empirical study on how banks actually work was finally published (followed by a second study in 2015) and thus ended the centuries’ old debate about whether banks are (a) mere financial intermediaries passing on savings (deposits) as loans to borrowers, as the leading journals and textbooks proclaim today; (b) whether they need central bank reserves or deposits to lend these on to their customers (fractional reserve theory), so that each bank is an intermediary, but in aggregate more money is created by the banking system in a collective fashion – as a previous generation of unwitting central bank spokesmen had argued; or (c) whether they instead are not financial intermediaries at all, but creators of the money supply, so that each bank creates new purchasing power that is added to the money supply when it extends a loan, thus deciding about the amount and allocation of new money creation – a pivotal function in the economy. The empirical tests rejected the financial intermediation and fractional reserve theories (Werner, 2014a, 2015) and showed that banks do not need prior savings, nor central bank reserves or other deposits to lend. 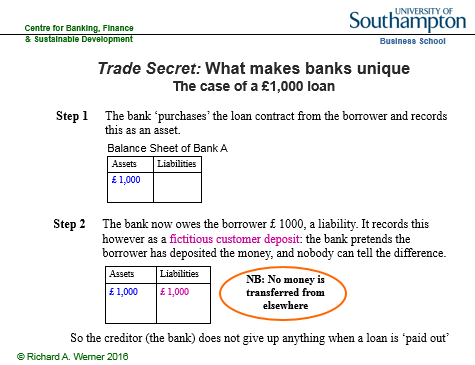 Instead, banks create new money when they do what is called ‘bank lending’, and add it to the money supply (see Figure 1). Bank loans thus do not transfer existing purchasing power, but add net new purchasing power. The banks’ lending creates 97% of the money supply. Bankers’ decisions about how much money is lent – and thus created and added to the money supply – and given to whom for what purpose quickly reshapes the economic landscape and affects us all. Sadly, no regulator has asked banks to ensure they lend for productive and environmentally projects – over two thirds of UK lending is not for productive purposes that creates jobs or boosts GDP, but instead for assets, causing asset price inflation. After the first domino of the central banking narrative collapsed, the other dominos quickly toppled over, as well: An often-repeated mantra of central bankers is that lower rates will stimulate the economy and higher rates will slow it. Currently, central bankers are once again deploying this claim, in order to justify a further reduction of interest rates to zero or even negative territory with the claim that this is necessary to stimulate the economy. So far, commentators and journalists have not challenged this central banker narrative, as it had been extensively propagated over the previous decades and is accepted as fact by most. This negative correlation between interest rates and economic growth, and also the idea that causation runs from interest rates to economic growth is so well established in everyone’s consciousness that we simply assume there is abundant empirical evidence to back it. Surely, the thousands of mathematicians and economists working for central banks (central banks are, after all, the largest employers of economists world-wide) will have crunched the numbers and produced hundreds of studies demonstrating this? The funny thing is: they haven’t. In fact, among the more than 10,000 research articles produced by the major central banks in the two decades prior to the 2008 crisis, none explored the correlation or causation between nominal interest rates and nominal GDP growth. Fortunately, this task is not very demanding, and once we conduct such an examination, we conclude that, in actual fact, there is no evidence to back these assertions whatsoever. To the contrary, empirical evidence shows that the central banking narrative on interest rates is diametrically opposed to the observable facts in two dimensions: instead of the proclaimed negative correlation, interest rates and economic growth are positively correlated. Secondly, the timing shows that interest rates do not move ahead of growth, but instead are either coincidental or even follow it. Consider Figure 2, which uses the example of US long-term interest rates (benchmark US Treasury yields) and nominal GDP growth rates (year-on-year percentage growth), as well as Japanese short-term rates (overnight call rates) and nominal GDP growth rates. 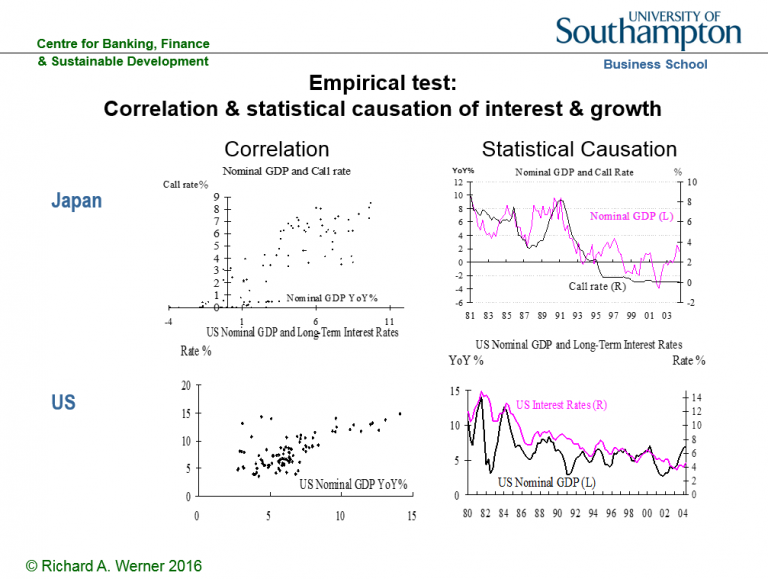 As can be seen, the central banking narrative is wrong in two dimensions: instead of the proclaimed negative correlation, the scatter plots on the left-hand side of the graph show a distinct positive correlation (Werner, 1995, 2005). But lest anyone thinks this is due to the timing and the role of leads and legs, the graphs on the right-hand side consider the time series of the same data. As can be seen in the upper right graph, in 1987 Japanese nominal GDP growth accelerated sharply, and it took about two years for short-term interest rates to follow. In 1989, GDP growth decelerated, and only after a lag did short-term interest rates follow. Some observers may argue that central banks are naturally behind the curve of the economy, and hence so are short-term interest rates, while bond markets would not lag behind the economy. But this is also true for bond markets. The bottom right graph in Figure 2 shows the yield in the most liquid securities market in the world, that for US benchmark Treasuries, plotted against nominal GDP growth. The positive correlation of both curves is obvious. Moreover, there is no evidence that interest rates precede the economy. Quite the contrary, there seems evidence that interest rates follow nominal GDP, most blatantly in the 1980s: it took over one year for interest rates to fall, after nominal growth had collapsed in the early 1980s, and after the sharp growth acceleration in 1983 it took over a year for bond yields to rise. For decades, even US interest rates have not moved ahead of growth, but instead they followed it. Thus instead of the central banking narrative that lower rates lead to higher growth, the empirical and verifiable reality is that higher growth leads to higher rates and lower growth leads to lower rates. If rates are the result of growth, they cannot be the cause. This raises some new questions. Firstly, if it is not interest rates that drive growth, what then? And secondly, why do central banks keep insisting that they are using interest rates as their main monetary policy tool, when this is simply impossible? Recently, central banks have been lowering rates, while proclaiming that this is a measure to stimulate the economy. But the empirically verifiable fact is that they lowered rates, because economic growth has decelerated. Falling growth means interest rates must follow down. And what has been the role of central banks in the growth slowdown preceding the lower rates? We may presume that they had not used their vast powers to engineer economic growth – powers they worked hard to obtain in previous decades, in the form of independence with little meaningful accountability. Instead of unravelling this mystery, central bankers have been making counter-factual assertions about the causation of interest rates and growth. Yet we know them to be in possession of thousands of highly trained staff and the best quantitative data sources on the economy of anyone. Since the hypothesis of complete incompetence or irrationality is a last resort, it stands to reason to adopt the working hypothesis that central banks have employed these counter-factual assertions on purpose. Two reasons come to mind: Firstly, they are using the interest rate narrative in order to suggest that they are adopting beneficial policies, when this may not really be the case. Secondly, they may in this way be able to distract public attention from the true causal relationships in the economy. In this case, a far less benevolent interpretation of central bank policy becomes suggestive. As Forder (2002) has argued, obfuscation has served central banks particularly well since they have become so all-powerful: the danger for them in this era of unprecedented powers is that the general public may simply (and rightly) link bad economic outcomes to bad economic policies adopted by central banks, not to the – now far less powerful – governments. In other words, since almost all economic keys have been handed over to the central banks, one can reasonably expect them to be blamed for the economic mess that is such a recurring feature of economic policy during those decades of ever greater central bank power. As a defense mechanism, central banks could be expected to argue that they are doing all in their power to help the economy, while pinning the blame on other actors. But for this to work, observers need to be misinformed about what the true levers of monetary policy are. A desire by central banks to misinform would explain why they have spent vast resources on “economic research” – pseudo-scientific writings that are often far removed from reality, but are designed to place any blame for the terrible economic performance that they have been responsible for on other actors – preferably the government, fiscal policy or ‘irrational’ and ‘uneducated’ ordinary people who are looking for ‘easy answers’ or seeking ‘populist explanations’, while anyone contemplating the possibility that big banks and central banks might not always look after the public interest and instead might collude in order to put their own objectives first is identified as a ‘conspiracy theorist’. In other words, the “economic research” produced by central banks is usually of a kind that at best looks like political PR to objective observers, if not outright propaganda. 3. Markets are never in equilibrium, thus don’t be fooled by prices, but consider quantities: The short side exerts power. If there is no empirical evidence for the interest rate narrative, it is reasonable to ask where it came from in the first place. In other words, what is the origin of the idea that interest rates are the most important economic policy variable? We have ascertained that it did not emerge from empirical facts. Looking into its origin, one finds that it is a claim deriving from theoretical economics. The theory proposing the special role of interest rates can be derived from the central – some say only – graph in economics that shows demand and supply: it consists of an upward-sloping supply curve and a downward-sloping demand curve in price-output space. Under a number of assumptions prices are said to move so that demand equals supply. This seems eminently reasonable at first glance: after all, if prices are too high, excess supply will be left unsold, resulting in price cuts and hence a fall in prices, until demand equals supply. Likewise, if prices are too low, excess demand will quickly drive up prices back to the “equilibrium” level – the point at which demand equals supply. This story is told about virtually any market: in the case of the labour market, the price is the wage. In the case of the money market, the price is the interest rate. This “equilibrium” graph (Figure 3) and the ideas behind it have been re-iterated so many times in the past half-century that many observes assume they represent one of the few firmly proven facts in economics. Not at all. There is no empirical evidence whatsoever that demand equals supply in any market and that, indeed, markets work in the way this story narrates. We know this by simply paying attention to the details of the narrative presented. The innocuous assumptions briefly mentioned at the outset are in fact necessary joint conditions in order for the result of equilibrium to be obtained. There are at least eight of these result-critical necessary assumptions: Firstly, all market participants have to have “perfect information”, aware of all existing information (thus not needing lecture rooms, books, television or the internet to gather information in a time-consuming manner; there are no lawyers, consultants or estate agents in the economy). Secondly, there are markets trading everything (and their grandmother). Thirdly, all markets are characterized by millions of small firms that compete fiercely so that there are no profits at all in the corporate sector (and certainly there are no oligopolies or monopolies; computer software is produced by so many firms, one hardly knows what operating system to choose…). Fourthly, prices change all the time, even during the course of each day, to reflect changed circumstances (no labels are to be found on the wares offered in supermarkets as a result, except in LCD-form). Fifthly, there are no transaction costs (it costs no petrol to drive to the supermarket, stock brokers charge no commission, estate agents work for free – actually, don’t exist, due to perfect information!). Sixthly, everyone has an infinite amount of time and lives infinitely long lives. Seventhly, market participants are solely interested in increasing their own material benefit and do not care for others (so there are no babies, human reproduction has stopped – since babies have all died of neglect; this is where the eternal life of the grown-ups helps). Eighthly, nobody can be influenced by others in any way (so trillion-dollar advertising industry does not exist, just like the legal services and estate agent industries). It is only in this theoretical dreamworld defined by this conflagration of wholly unrealistic assumptions that markets can be expected to clear, delivering equilibrium and rendering prices the important variable in the economy – including the price of money as the key variable in the macroeconomy. This is the origin of the idea that interest rates are the key variable driving the economy: it is the price of money that determines economic outcomes, since quantities fall into place. But how likely are these assumptions that are needed for equilibrium to pertain? We know that none of them hold. Yet, if we generously assumed, for sake of argument (in good economists’ style), that the probability of each assumption holding true is 55% – i.e. the assumptions are more likely to be true than not – even then we find the mainstream result is elusive: Because all assumptions need to hold at the same time, the probability of obtaining equilibrium in that case is 0.55 to the power of 8 – i.e. less than 1%! In other words, neoclassical economics has demonstrated to us that the circumstances required for equilibrium to occur in any market are so unlikely that we can be sure there is no equilibrium anywhere. Thus we know that markets are rationed, and rationed markets are determined by quantities, not prices. On our planet earth – as opposed to the very different planet that economists seem to be on – all markets are rationed. In rationed markets a simple rule applies: the short side principle. It says that whichever quantity of demand or supply is smaller (the ‘short side’) will be transacted (it is the only quantity that can be transacted). Meanwhile, the rest will remain unserved, and thus the short side wields power: the power to pick and choose with whom to do business. Examples abound. For instance, when applying for a job, there tend to be more applicants than jobs, resulting in a selection procedure that may involve a number of activities and demands that can only be described as being of a non-market nature (think about how Hollywood actresses are selected), but does not usually include the question: what is the lowest wage you are prepared to work for? Thus the theoretical dream world of “market equilibrium” allows economists to avoid talking about the reality of pervasive rationing, and with it, power being exerted by the short side in every market. Thus the entire power dimension in our economic reality – how the short side, such as the producer hiring starlets for Hollywood films, can exploit his power of being able to pick and choose with whom to do business, by extracting ‘non-market benefits’ of all kinds. The pretense of ‘equilibrium’ not only keeps this real power dimension hidden. It also helps to deflect the public discourse onto the politically more convenient alleged role of ‘prices’, such as the price of money, the interest rate. The emphasis on prices then also helps to justify the charging of usury (interest), which until about 300 years ago was illegal in most countries, including throughout Europe. However, this narrative has suffered an abductio ad absurdum by the long period of near zero interest rates, so that it became obvious that the true monetary policy action takes place in terms of quantities, not the interest rate. Thus it can be plainly seen today that the most important macroeconomic variable cannot be the price of money. Instead, it is its quantity. Is the quantity of money rationed by the demand or supply side? Asked differently, what is larger – the demand for money or its supply? Since money – and this includes bank money – is so useful, there is always some demand for it by someone. As a result, the short side is always the supply of money and credit. Banks ration credit even at the best of times in order to ensure that borrowers with sensible investment projects stay among the loan applicants – if rates are raised to equilibrate demand and supply, the resulting interest rate would be so high that only speculative projects would remain and banks’ loan portfolios would be too risky. The banks thus occupy a pivotal role in the economy as they undertake the task of creating and allocating the new purchasing power that is added to the money supply and they decide what projects will get this newly created funding, and what projects will have to be abandoned due to a ‘lack of money’. It is for this reason that we need the right type of banks that take the right decisions concerning the important question of how much money should be created, for what purpose and given into whose hands. These decisions will reshape the economic landscape within a short time period. Moreover, it is for this reason that central banks have always monitored bank credit creation and allocation closely and most have intervened directly – if often secretly or ‘informally’ – in order to manage or control bank credit creation. Guidance of bank credit is in fact the only monetary policy tool with a strong track record of preventing asset bubbles and thus avoiding the subsequent banking crises. But credit guidance has always been undertaken in secrecy by central banks, since awareness of its existence and effectiveness gives away the truth that the official central banking narrative is smokescreen. A basic argument by economists has been that we first need to accumulate scarce savings in order to fund investments and hence enjoy economic growth – or alternatively borrow those savings from abroad by taking a loan from the international banking community. But this argument is based on the erroneous belief that banks are merely financial intermediaries that require savings first in order to be able to lend money out. In reality, increased domestic investment requires neither savings nor borrowing from abroad. Domestic banks can fund domestic investment without prior savings becoming available. Once we realize this, the power of the bankers crumbles. It has been their ploy to pretend that they were issuing what is a very scarce and precious resource – savings or money. For if it was not scarce, why should we be prepared to pay the bankers for this service (in the form of interest)? Governments could just create their own money, without having to pay interest on the national debt (which by now in a number of countries takes up the majority of national annual budgets – usually well hidden from the eyes of the public, by publishing only the fiscal budgets that are considered “discretionary spending” – pretending that interest payments are non-negotiable and compulsory). Or in the words of Leo Tolstoy (paraphrased): The reason why economists single out ‘labour’ and ‘capital’ in their ‘production function’ is, firstly, because they want to charge for ‘capital’ (interest), justifying it as being equivalent to the wages that workers get, and secondly, because nobody has figured out how to charge for the sun light, the air and other necessary factors of production. And they can only charge for ‘capital’, because economics has been designed to create the myth of its scarcity. That money is not in fact a scarce resource, but a tool that can and should be employed by governments as benefits communities and nations is also true for developing economies and emerging markets: the “Third World Debt Crisis” was unnecessary, since for most purposes the affected countries did not need to borrow money from the foreign bankers in order to grow their economies. Worse, the foreign money from the foreign currency-denominated loans given to developing countries never even reached the borrowing economy’s borders. This is because it is one of the rules in international banking that pound sterling bank money stays with UK-authorised banks, euros stay in eurozone economy banks and US dollars remain with US banks. A so-called “US dollar deposit” in the UK is in actual fact a deposit with a US bank that is crediting the account of its UK respondent bank with this amount. Thus when a developing country borrowed from the international banks, they invariably lent dollars, pounds, euros or other currencies of industrialised countries, because the foreign bankers can only create foreign money (and they do create it out of nothing). The cruel joke on developing countries is now that those foreign dollars or euros that they borrowed will always stay abroad, in their respective foreign banking systems. It is of course possible to sell the foreign currency and purchase domestic currency with it – but that only results in domestic bank credit creation, something that can be undertaken without getting indebted to foreign bankers in foreign currency in the first place – while it is the borrowers who are made to shoulder the large foreign currency risk. 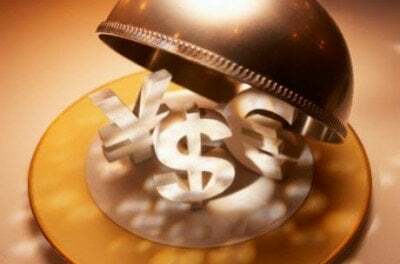 As the currencies of developing countries invariably fall over time against those of industrialised countries, they quickly get stuck in a foreign debt trap, unable to service or repay the foreign debt which is spiraling out of control in domestic currency terms. That is when the foreign vultures move in and demand ‘debt for equity swaps’, handing over valuable domestic assets, land, mines, mineral resources or mining rights, from poor countries to the rich foreign bankers, who had in any case simply created the money out of nothing. The developing country debt is in fact a form of predatory lending to ensure that the former colonies remain, in economic terms, in the hands of their former masters – if they have attractive assets, that is. Most of all, the round-trip via foreign banks is wholly unnecessary, if the borrowing nations want domestic currency: that is only created by their own banking system. Thus it is becoming apparent that the central banking narrative of scarce money and scarce savings has been a hoax. This has become particularly obvious since central banks have opened all taps and created trillions of dollars and euros and handed them over to the big banks and large-scale financial speculators – under the pretense that this is ‘necessary’ or would somehow benefit society at large. (Their definition of this activity as ‘quantitative easing’ is also designed to mislead: the original thrust of quantitative easing is an expansion in credit creation for the real economy, not mainly for the financial markets – see my writings on this in Japan in the mid to late 1990s, or Voutsinas and Werner, 2011; Lyonnet and Werner, 2012; Werner, 2013). 5. Deregulation, liberalization and privatization do not enhance growth – they reduce it. The first four pillars of the central banking narrative have collapsed: Banks create money out of nothing and thus reshape the economy in their image. Markets are rationed and the key factor is the quantity of bank credit. Bank credit creation for GDP transactions boosts GDP growth, no matter what interest rates do (they will follow GDP growth). Developing countries do not need to borrow from abroad, and in fact should not borrow from abroad, as this puts them unnecessarily at mercy of the foreign creditors. As these pillars revolve around banks and money and credit, some economists may agree, but argue that economics has long focused on the real economy and purposely chose to ignore all the financial factors. In this real economy, they will argue, the most important principle is to allow market forces to act without being hampered by governments – then we will see economic growth and stability. Should this fifth pillar of the central banking narrative at least be true? Judging by the publications of the central banks, as well as the IMF or the World Bank, one would expect so: When these Washington-based institutions send their teams of staff and hired consultants to developing countries, their job can usually be completed very quickly. Without much ado, a new country report complete with major policy conclusions is drafted. The secret of such efficient work: even before these foreign experts had travelled (first class) to the respective countries, the conclusions of their study had already been pre-determined, because they are always the same, no matter which country is concerned: The goal of the axiomatic-deductive neoclassical belief system is to find ex post justifications for the argument that government intervention is bad, and markets need to be unfettered by any form of intervention. This predetermined conclusion is then presented, in the form of ‘research reports’ or ‘studies’, to the leadership of many nations across the world, only vaguely connected to local facts and institutions. In order to reach such conclusions, neoclassical and central bank economists worked backwards: What kind of model comes to such conclusions? Answer: A model that operates in a dream-like idealized world. What are the features that define such a world? A long list of assumptions needs to hold, creating a bizarre theoretical Neverland: perfect information, complete markets in equilibrium, perfect competition, zero transaction costs, no time constraints, perfectly flexible prices that adjust all the time, everyone is very selfish and does not care about others, and people are not influenced by others. Why do all these assumptions matter? Because neoclassical economists have proven that they all need to jointly hold true, for market equilibrium and efficient markets to exist, and for government intervention to be ineffective. The next step in the sequence of using such models is the most important one: present in reverse order, by pretending that no pre-determined conclusions existed. Start by listing the assumptions – for sake of argument. Then present the model. Then pursue it to its conclusions, which happen to be… let’s see… Oh, amazing: this model happens to conclude government intervention is bad and only free and deregulated markets will work! Well, in that case, ladies and gentlemen, we shall need to recommend deregulation, liberalization and privatization! That such economic charlatanry passes for ‘economics’ in leading journals, textbooks and university lecture rooms is a sad indictment not only of the economics establishment, but of academia and society at large. But what about economies in our world, on the planet we live – as opposed to the bizarre planet described by the economic charlatans? Since none of these assumptions hold, we know that we can neither expect equilibrium nor will deregulation, liberalization and privatization trigger improved economic growth. If our theoretical assessment of the theoretical claims is correct, we should also be able to muster empirical support for it. And it exists in abundance. 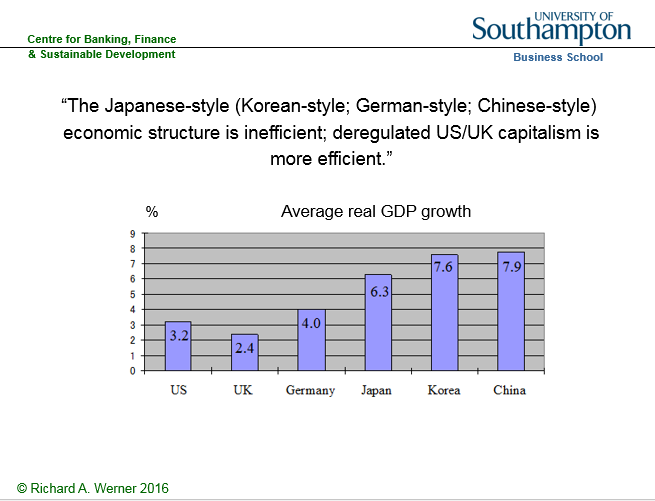 In order to test these neo-classical policy recommendations of deregulation and market supremacy, we can compare the market-oriented and shareholder value-focused US and UK economies with those economies known to have always placed an emphasis on government intervention, non-market forms of resource allocation combined with social welfare systems, namely Germany, Japan, Korea, Taiwan and China. Of course we should not be influenced by the business cycle, and thus need to consider a longer time period, such as half a century. Considering therefore the half-century from 1950 to 2000, we would expect the best performance in those economies that are more market-oriented, and the worst performance in economies that have chosen to practice intervention, ‘guidance’ and the use of production cartels. What is the empirical result? This can be seen in Figure 5. We find that it is the market-oriented, shareholder-oriented economies that perform worst. The economic performance of the East Asian non-market economies has been vastly superior. Many observers suspend disbelief, when they consider this result, and come up with many special reasons (i.e. introduce auxiliary assumptions) why this finding should not be taken at face value. Such a result must not be true, they seem to believe, hence it cannot be true. Perhaps a more sophisticated analysis will convince doubters. We can also examine the dynamics of deregulation and its impact on economic growth. The IMF and World Bank hired hands that are sent all over the world to ‘conclude’ what central banks also proclaim at home: country X needs to deregulate, liberalise and privatize in order to improve its particular economic performance. 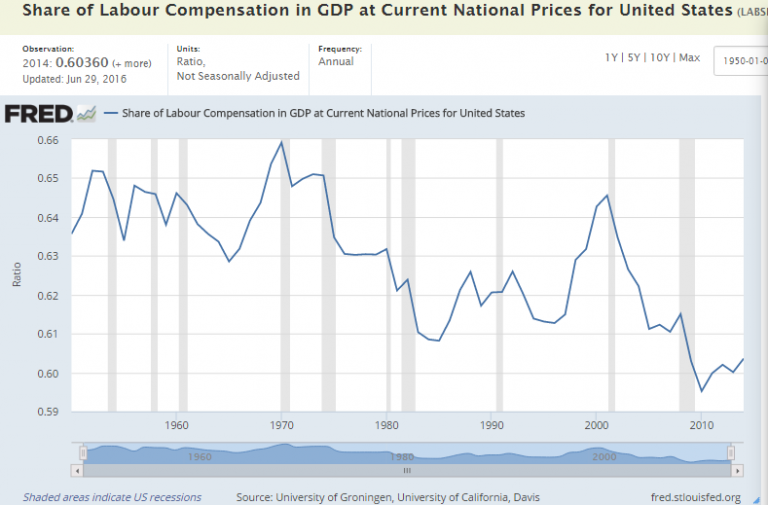 Thus an empirically testable hypothesis can be formulated: Is there any evidence that deregulation, liberalization and privatization have increased economic growth over time? Once again, the objective observer is stunned by the paucity of empirical evidence. Let us conduct our own test. For it to be meaningful, we should choose a country that has moved from a state of regulation, government ownership of large firms and non-market forms of economic organization towards complete deregulation, liberalization and privatization. Fortunately, a major industrialised economy has undergone the full spectrum of such a swing in the policy pendulum: By the late 1960s, Japan was effectively not a market economy, but a ‘guided economy’ in which over 1000 cartels (official exemptions to the anti-monopoly law) had been established, in which tens of thousands of economic regulations allowed the bureaucrats to intervene in the economy, in which the stock and bond markets were largely irrelevant (as most funding came from banks), and in which the labour market was famously full of ‘rigidities’ and ‘inflexibilities’, with life-time employment, seniority pay and company unions. Then, under US pressure, the Japanese government started to deregulate, liberalise and privatize state enterprises in the 1970s. (It was a hard sell: The Japanese wondered why they should give up their obviously successful system. Everyone knew that US elites were unhappy about the successful Japanese economy, yet US policy ‘advice’ to deregulate was given to Japan with the justification that it would ‘improve Japanese economic performance’ – as if any further growth was needed…). Japan, politically a US vassal, continued to deregulate. The trend of structural reform accelerated in the 1980s, and reached its zenith of a completely deregulated, liberalized and privatized economy in the early 2000s. This deregulation can representatively be measured by the number of cartels, which peaked in the 1960s in Japan and fell in line with US pressure, reaching zero in the 2000s. Below we shall plot the number of cartels against economic growth. Should the neoclassical theory be relevant, we would expect a negative correlation: as the number of cartels increases, economic performance deteriorates, and as the number of cartels drops, growth declines. As we can see, the neoclassical thesis has been rejected by the empirical evidence. In the 1950s, the designers of the Japanese economic system intentionally increased the number of cartels, in order to improve economic performance (Werner, 2003a). As we can see, as the number of cartels almost doubled to over 1000 by the late 1960s, while economic growth accelerated to double-digit figures. When, under US pressure, the number of cartels was reduced in the 1970s, growth dropped. The drop in cartels is accompanied by weaker and weaker economic growth. The deregulation drive culminated in the entire abolition of cartels by the end of the 1990s – and economic growth equally reached zero. A similar picture has been painted by the performance of many developing countries, including Argentina and African nations, which followed the economic advice of the Washington-based institutions. We conclude that the fifth of the central bank claims – that deregulation, liberalization and privatization enhances economic growth – has also been revealed to be fraudulent. As we saw, the central banking narrative has collapsed on all fronts. The main pillars of their false belief system, for too long propped up by fraudulent ‘economics’, have all crumbled. Thus a full-blown banking crisis must follow after a bank-credit driven asset bubble. One does not need to be a central banker to know this very well. (Why, then, did the ECB allow 20% or more bank credit growth in Ireland, Portugal, Spain and Greece, for several years? Such high credit growth is clearly in excess of nominal GDP growth and hence it is clear that it must be creating unsustainable asset bubbles that result in banking crises – as the Quantity Theory of Credit has postulated since its inception in 1992; Werner, 1992, 1997; 2012, 2013). 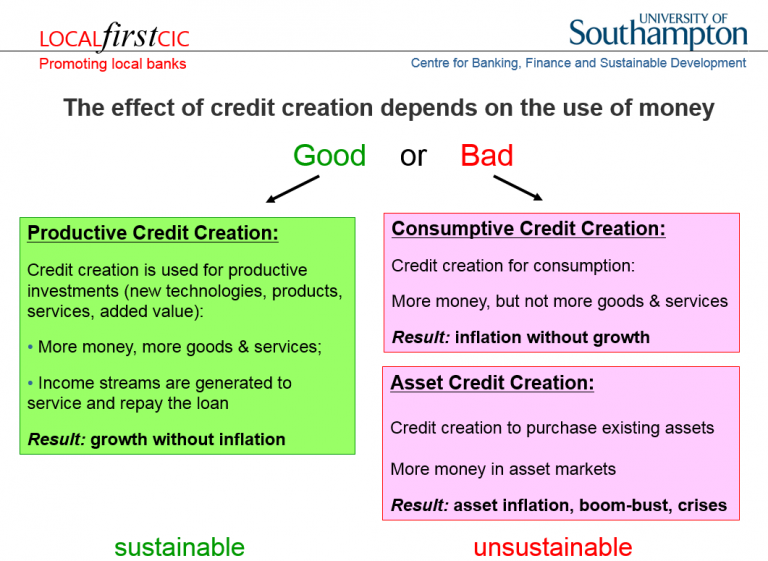 There is a third, redeeming case: When bank credit is used for productive investments, such as the implementation of new technologies, measures to increase productivity or the creation of new goods and services (whose value is higher than the mere sum of their inputs, thus adding value), then such new money creation – which always happens when banks grant credit –will not result in any form of overall inflation – neither consumer price inflation nor asset price inflation. This is because the new purchasing power that is created is used to produce higher value added output and hence the extra demand due to the money creation is met with a higher supply. By ensuring that money and credit are only created when something real is created, i.e. for productive purposes, one can achieve very high economic growth without inflation, without crises and in a relatively equitable way: This is how the East Asian ‘miracle economies’ of Japan, Taiwan, Korea and China, developed so quickly. By using regulation to ensure that bank credit is only created for productive purposes, high growth can be achieved, even when the economy is already at an apparent ‘full employment’ level, because productive investment credit improves the allocation of existing resources, however limited, by mobilizing both supply and creating the necessary demand for the output. But isn’t this central planning, which failed under communism? The reality in even the most deregulated economy is that the most important decision – about how much money the banks create and who it is given to – is in any case determined by bureaucrats (the loan officers working at the banks) without consideration of whether this is good for the economy or not. So rules to prevent harmful type of credit supply decisions by banks cannot be considered harmful or excessive intervention. What has worked well is the combination of market mechanisms with clever guidance in a small number of key areas – none more key than the creation and allocation of money – in order to prevent the worst excesses of capitalism and steer the economy towards a path that benefits all. This is necessary, because once unrealistic assumptions such as perfect information and efficient markets are relaxed, there is no guarantee that markets left to their own devices will produce socially optimal results. In reality, the hurdle for government intervention to be successful is far lower than is presented in the neoclassical models, which conjure an artificial idealized economy that purports to function so perfectly and efficiently already that no further improvement through intervention is possible. This unrealistic and artificial case is what the much trumpeted neoclassical claim that government intervention is inefficient or ‘bad’ is based on. 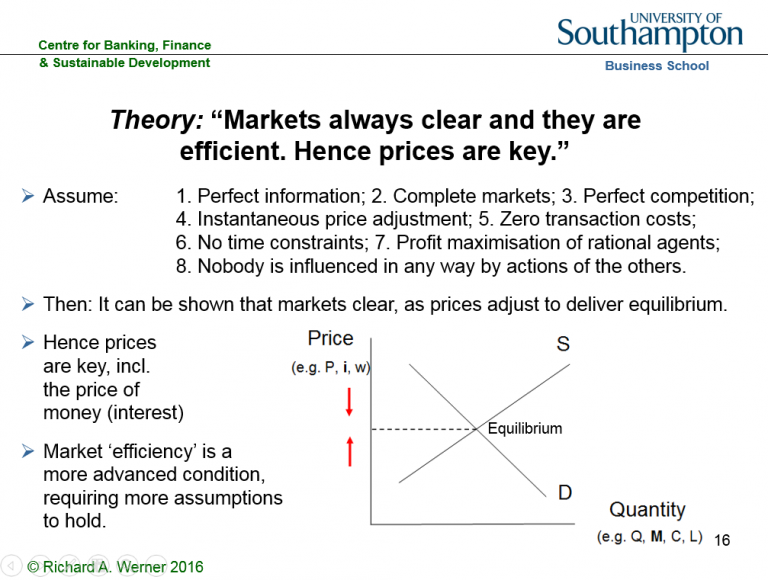 In reality, markets are neither efficient nor even in equilibrium. Hence it is relatively easy for clever intervention to deliver superior performance. This is precisely what the Germans and Japanese demonstrated to the world, and the Koreans, Taiwanese and Chinese demonstrated that these insights into clever institutional design and credit guidance can be exported and universally applied. The designers of the German and Japanese system based their institutional designs on a more realistic description of the world (see Werner, 2003a). The German-Japanese system worked by utilizing the willingness for co-operation and aiming at positive results for all that can be gained in the long-run (ditching the ridiculous claim that people would never co-operate but only selfishly maximize their own benefit). By focusing on mutually beneficial cooperation and coordination, they managed to internalize externalities, minimize information costs, and, most of all, motivate individuals. They recognized that ‘utility functions’ are interdependent, people compete in hierarchical fashion and have a common desire for justice and fairness of organizational arrangements. While neglected in static models and policy advice, human resources are taken more seriously in the German/Japanese model. As Ronald Dore pointed out “in Japan… people tend to be good at discerning possibilities of cooperation which can be of general benefit, and at devising organizational forms which can reap those benefits in ways which all participants can consider fair” (Dore, 2001, p. 38). One such organizational form is the system of industry associations, which are modern incarnations of the medieval guild structure. Due to their public goods character, resulting cartels were welfare-enhancing. The cooperative orientation does not mean there is no competition. As Dore explains well, competition can be fierce, as the system combines markets and hierarchies. The tendency towards the formation of cartels is counter-acted by relatively low concentration ratios in many industries (due to bank finance and cross-shareholdings which result in fewer hostile take-overs) and inter-firm rivalry due to life-time employment (Werner, 2003a). Finally, neoclassical economists assume that capital is the scarce resource, while ‘labour’ is in abundant supply, justifying a high reward for capitalists and a low reward for labour – resulting in a declining distribution of national income in favour of the capitalists and an ever declining share for labour. It is amazing that anyone can seriously sustain this view in a world awash with so much liquidity that its movement from one country to another keeps exchange rates in perpetual motion (Dore, 2001, p. 15). The reality of credit creation and our money supply being conjured ex nihilo by the banks in an act of modern-day alchemy puts paid to the neoclassical claim that capital is scarce. That must have been a reason why neoclassical theories refused to include banking in their models. The Anglo-Saxon model is good for the shareholders. By contrast, the Germans and Japanese maintained market mechanisms, but during the heyday of their model eliminated shareholders as the main beneficiaries (see Werner, 2003a). Instead of serving the few, a form of capitalism was born that succeeded in creating a decent quality of life for the many – employees and society at large: Managerial capitalism, or capitalism without capitalists. A centralised form of this type of economy may in the limit approach a fascist economy. Thus it is paramount that the power levers are decentralised and rendered accountable to local communities. Nationwide organisations are usually too large to allow effective and meaningful accountability. Why did the German and Japanese systems lose their way? Because they fell for the neoclassical central banking narrative – the surest way to reduce the efficiency of any economy. Thus Germany and Japan adopted the Anlgo-Saxon model. The changes this entailed increased “financialisation”, i.e. the share of economic activity devoted to profit-seeking by shifting ownership certificates from A to B (Werner, 2002b, Dore 2000). Adopting US-style capitalism means that Germany and Japan are importing its disadvantages and social problems. Dore asks: Can it be efficient to devote ever more people to servicing “gambling on uncertainties in financial markets” with analysis, advice, appraisal, advertising? As increasingly strong shareholders demand “value”, will social welfare or overall fairness increase? 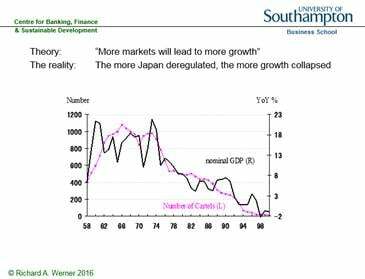 But has the weak Japanese performance since the 1990s not been proof that the Japanese system does not work well? Whether this is really true must be investigated, which I have done in several publications (Werner, 2003a, 2004, 2005). The evidence clearly suggests that the Japanese recession was not due to the economic structure, but instead to a central bank aiming at dismantling welfare capitalism, and in order to do this, intentionally engineering and prolonging the Japanese recession. The often touted demographic explanation of weak economic growth also does not convince: As I explain elsewhere (Werner, 2004), Japan’s weak economic performance has not been due to structural factors (the supply side). This is easily established, since resources have been unemployed, and economic growth has remained below potential growth (hence the deflationary pressure). Moreover, even if one considered the Japanese fertility rate, it is clear that past monetary policies have not done much to raise it; to the contrary, the property bubble of the 1980s and continued high property prices have made it harder for families to find affordable homes. 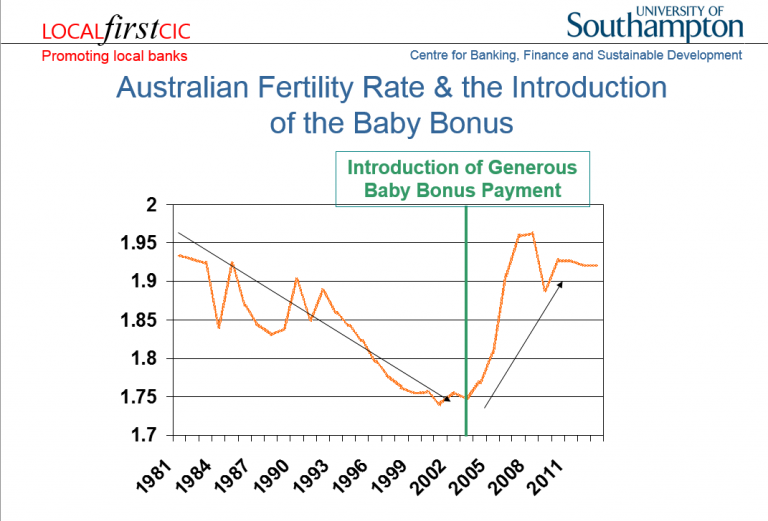 Most of all, the central bank could easily have reversed the trend of a falling fertility rate, by giving families meaningful incentives to have more babies. I proposed many years ago for the Bank of Japan to create and pay out the equivalent of USD200,000 for each newly born baby – which would not cost the tax payer anything. Such true ‘people QE’ would be the most productive use of credit creation, since technology drives the growth potential of an economy, and that can only be produced by people. Moreover, each human born thanks to this policy would pay back this ‘people QE’ amount several times over through their lifetime contributions in labour, taxes, welfare contributions and other positive input into society. That such monetary incentives work well has been demonstrated in Russia and Australia, where far more modest payments – of less than USD10,000 (and funded from the finance ministry, not the central bank, i.e. 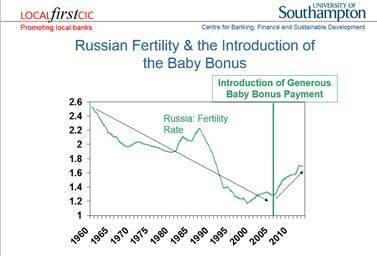 costing tax payers) already succeeded in reversing the demographic decline (Figures 9 and 10). However, instead of solving the demographic decline in Japan, the Bank of Japan has chosen to prolong the recession, which has changed the labour market and made jobs – and hence family incomes – far more precarious than in the past. So it is clear and visible that the central bank narrative has collapsed. How have central banks reacted to these revelations? Their response has been the launch of a multi-faceted and audacious bid to concentrate even more power in their hands. Officially, this has happened to stimulate the economy. But lower rates do not stimulate the economy. To the contrary, such low interest rates are actively harmful to economic growth, because they lead to higher borrowing costs (as seen in Switzerland after negative interest rates on bank holdings of reserves at the central bank were introduced). Moreover, they squeeze profit margins of the banks so much that the banking sector comes under massive pressure to merge and amalgamate. Larger banks lend less for productive purposes and engage more in financial transactions banking. As bank credit creation for productive purposes shrinks, nominal GDP growth stagnates and may even contract, resulting in deflation (as witnessed in Japan for much of the past two decades). Why are central banks engineering low growth, deflation and bank amalgamations? On 21 September 2016, ECB head Mario Draghi (a former banker with Goldman Sachs) said that “There are overcapacities in the banking sector of some countries” in the Eurozone. Which country could he have been talking about? Germany boasts by far the largest number of banks – about ten times as many as the global centre of international finance, the UK. 80% of these banks in Germany are local, not-for-profit community banks, which do not pay bankers’ bonuses, and which serve ordinary people and small firms, creating a strong SME sector (the main employer in most countries). Why is the ECB taking policies that are killing the majority of banks in the Eurozone – the beneficial not-for-profit community banks – while helping big banks with its asset purchases? Central banks and their media spokesmen have thrown their weight behind so-called ‘monetary reform’ movements to abolish bank credit creation altogether. The ‘monetary reform group’ Positive Money appears well funded in the country of its founding (the UK), and it seems suggestive that its members have appeared at national and international events and conferences together – and apparently singing from the same hymn sheet – with the Bank of England and the George Soros (Gyorgy Schwartz)-funded INET (‘Institute for New Economic Thinking’). Thus the Bank of England recently hired a monetary reform advocate from the IMF. While monetary reform is potentially a worthwhile cause, it all depends on how exactly the system gets reformed. What is surprising is that despite all the appearance of ‘debate’ among ‘monetary reformers’, their conclusion seems to have been fixed in advance and never varies – and no discussion is allowed about alternative conclusions (a rehash of the neoclassical economics methodology). What is that much-hailed policy conclusion? Who should be the sole creator and allocator of all money, which would then all be digital? I suppose the reader will by now have guessed it. Well, of course, it should be the central bank. So ‘reform radicals’ like Positive Money propose to make the Bank of England yet even more powerful. In order to fully dominate such a centralized monetary system that consists only of the central planners at the central bank as sole money creator (a system reviving that of the Soviet Union, where there was only one central bank and no other banks), the central banks wish to get rid of cash, as its use cannot be monitored in real time. In their bid for total centralized control over all economic transactions, the central banks are thus proposing to replace cash with their own digital currency that will be used by all in the economy. Together with the abolition of cash and the abolition of bank credit creation, central banks would in this case achieve total control over all economic transactions and those who conduct them. During the last four decades, many asset bubbles and banking crises have marred the economy and pushed society off balance. There have been well over 100 banking crises and subsequent recessions during this time period. These boom-bust cycles have caused an unprecedented transfer of wealth from the many to the few. This redistribution of incomes and wealth has resulted in unprecedented levels of inequality. This time period also coincides with a period of unparalleled power in the hands of central banks. Under pressure from the IMF and, in Europe, Brussels legislators, country after country made their central bank independent from governments and usually – and surprisingly – also independent from and unaccountable to parliaments. Thus lacking the constraints of the normal democratic process, central banks have been free to choose their tools, targets and modus operandi. They have been entirely free to choose their policies. The job of central banks has been to engage in monetary policy in order to deliver stable prices, stable growth and stable currencies. However, central banks have thoroughly failed in this, as the frequency and amplitude of business cycles has increased during this time period, and more traditional cycles of growth and recession have been replaced by boom-bust cycles. The creation of the newest major central bank, the European Central Bank, is a case in point. The treaties that established it granted it unprecedented powers, unchecked by any democratically elected assembly. This was unprecedented, but only in the post-war era. As I argued in my 2003 book Princes of the Yen and an academic research paper (Werner, 2006), the ECB was not modelled on the successful Bundesbank in Frankfurt, but the disastrous prior German central bank, the Reichsbank, which created asset bubble and bust, deflation, hyperinflation and essentially caused the economic chaos that helped bring Adolf Hitler to power, after which the Reichsbank, under the leadership of the same man that had created this chaos in the 1920s, then reflated rapidly, rendering this previously marginal fringe-politician highly popular. The problem with the Reichsbank was its excessive independence and lack of any accountability to German institutions or parliament whatsoever. Thus the founders of post-war Germany were wise to change the new central bank’s status by significantly curtailing its independence: the Bundesbank was made accountable and subordinated to Parliament, as one would expect in a democracy. It became probably the world’s most successful central bank. While the Brussels centralisers, when pushing the Maastricht Treaty (signed in 1992), portrayed the ECB as having been modelled on the successful Bundesbank (also situated in Frankfurt), the truth could not have been further from it. Instead, the ECB was made independent from and unaccountable to any democratic assembly, as well as to governments. The ECB had in fact been modelled on the disastrous Reichsbank. Based on this analysis, I warned in 2003 that the ECB was likely to abuse its excessive powers by creating vast credit booms, asset bubbles and banking crises in the Eurozone. This it duly did, from 2004 to 2008 in Ireland, Portugal, Spain and Greece, as well as other parts of the Eurozone. As it turned out – and as we know from former ECB head Jean-Claude Trichet’s speech in Aachen in 2011 – the goal of ECB policy was not to create stability. Instead, it was the insidious plan to cause havoc, by creating asset bubbles that could then be pricked, all the while blaming greedy speculators and bankers. The ensuing recession could be used as justification for deep structural reforms (as the Bank of Japan has done in Japan, the Bank of Thailand after the Asian crisis), and, more importantly, in order to introduce a United States of Europe with centralized monetary and fiscal powers. The latter goal of a ‘European Finance Ministry’, so desired by ECB-head Trichet, was essentially achieved thanks to the crisis with budgetary control now residing in Brussels, and a supranational ESM having been established that can de facto operate as European finance ministry, without any democratic accountability – or even scrutiny by any policy force or public prosecutor. A senior member of the ECB council and for many years governor of one of the national central banks that are part of the ECB confirmed in private and off-the record discussion how he was shocked at the democratic deficit of the ECB and how it had abused its powers to achieve political goals, such as in the ‘negotiations’ with the humiliated Spanish and Greek governments. Central banks are now in the process of consolidating their powers. They wish to get rid of competition in the form of paper money or bank credit. They are driving both cash and bank credit out of business through their negative interest rates, which are not designed to stimulate the economy, but to create deflation and further havoc. – Havoc that they intend to instrumentalise to accelerate their goal of becoming the complete masters of our lives, by allowing only digital currency that they issue and control – and that they can monitor in terms of all transactions, and that they can switch off, if, for instance, some pesky dissident criticizes them too much. On this road to Orwellian totalitarianism by the central planners at the central banks, it is only a small further step to argue that the little chips on our digital cash cards would be safer – in the name of combatting crime again! – if one embedded them under the skin of our right hands, or our foreheads. The overarching trend of the 20th century has been the concentration of power in the hands of the few. This has not been a healthy trend, as many millions of innocent people died during the 20th century. Central banks have been key beneficiaries and today’s locus of this unprecedented concentration of power. At the same time, central banks lack accountability. There is no meaningful way in which central banks are held to account for their massive policy ‘mistakes’ and reckless creation of vast boom-bust cycles, massive banking crises and large-scale unemployment (with youth unemployment at over 50% in Spain and Greece). This unaccountable, hence limitless and absolute power in the hands of the central bankers has consequences. Most central banks were created as cartels by big banking groups. Today, many central banks remain in private hands – such as the Federal Reserve Bank of New York, the Italian, Greek or South African central banks. The solution to this concerted threat to our civil liberties and our freedom can only be to try to advance the opposite agenda: the decentralization of power. We can decentralize power in our monetary system by abandoning the big banks and instead creating and supporting local not-for-profit community banks and ultimately a system of local public money issued by local authorities as receipts for services rendered to the local community. One reason why central banks have sprung so frantically into action after their narrative had been thoroughly disproven is that the revelations about the nature of money has drawn the curtain open and allowed the public to see what is in the innermost sanctum of their central banks: nothing. Just like the Wizard of Oz in the Emerald City thrived on his reputation, while behind his curtain nothing could be found, so have central banks relied on politicians and the public not understanding the nature of money and the role of central banks. The truth of the matter is: We don’t need central banks. Since 97% of the money supply is created by banks, the importance of central banks is far smaller than generally envisaged. Moreover, the kind of money that commercial banks create is not privileged at law. Legally, our money supply is simply private company credit, which can be created by any company, with or without banking license. Eurozone countries, having given up the right to their own currencies, can still create money and reflate the economy: the government, for instance in Spain, simply needs to stop the issuance of government bonds, and fund the entire public sector borrowing requirement from the domestic banks that create it out of nothing – and can do so at more competitive rates as the bond markets: this policy of Enhanced Debt Management (Werner, 2014b) not only would make it obvious that Spain does not need the ECB, but it would also put the national debt profiteers – the bond underwriting firms such as Goldman Sachs and Morgan Stanley – out of business. This reality of private money creation also means that we can, without legal obstacles, create a decentralized system of local currencies, without central bank involvement. The key principle of such decentralization is local autonomy, self-determination, self-responsibility and self-administration. These are in fact the fundamental principles of the co-operative movement, as championed by Hermann Schultze-Delitzsch and Wilhelm Raiffeisen over 150 years ago. This co-operative movement early on realized that a crucial role for co-operatives is in the creation of co-operative banks controlled by the local communities. Sadly, in the UK credit unions are not banks, since they are not allowed to lend to firms in meaningful amounts, and don’t have a banking license. Thus we need to create true community banks. It is easier to find people fit to govern themselves than people fit to govern others. Towns were the nursery of freedom. The German banking system is dominated by 1,500 community banks, which are also the majority of banks in the entire EU. This means that 80% of German banks are not-for-profit, which has strengthened the German economy for the past 200 years. A banking system consisting of many small banks is also far less prone to boom-bust cycles and it creates more jobs per given amount of loan than large banks. Thus community banks also result in a more equal income and wealth distribution. Local banking is highly popular in Germany, because SMEs get access to finance that would not be serviced by large banks. The community banks provide their services at competitive rates and support their customers also during recessions. With community banks, the wider community gets a bank whose goals are aligned with theirs, banks that pay taxes, banks that support local growth and jobs. At the same time community banks offer customers a place to put their money where it can benefit the local community, not far-flung projects or speculators. Can we tackle this challenge? Until the 1970s, there has been much optimism in economics and there have been high expectations that many of the problems of mankind would soon be solved. Was this a reasonable expectation? Voutsinas, Konstantinos and Richard A. Werner (2010). The Effectiveness of ‘Quantitative Easing’ and the Accountability of the Central Bank in Japan. Paper presented at 8th Infiniti Conference on International Finance, Trinity College, Dublin, 14-15 June 2010, the 27th Symposium in Money Banking and Finance, Université Montesquieu-Bordeaux IV, 17-18 June 2010, and the MMF 2010 Annual Conference at the Cyprus University of Technology, Limassol, 1-2 Sept. 2010. Werner, Richard A. (1995), Liquidity Watch, Tokyo: Jardine Fleming Securities (Asia) Ltd.
Werner, Richard A. (1997). ‘Towards a New Monetary Paradigm: A Quantity Theorem of Disaggregated Credit, with Evidence from Japan’, Kredit und Kapital, vol. 30, no. 2, July 1997, pp. 276-309. Werner, Richard A. (2002). ‘Monetary Policy Implementation in Japan: What They Say vs. What they Do’, Asian Economic Journal, vol. 16 no.2, Oxford: Blackwell, pp. 111-151. Werner, Richard A. (2003b). 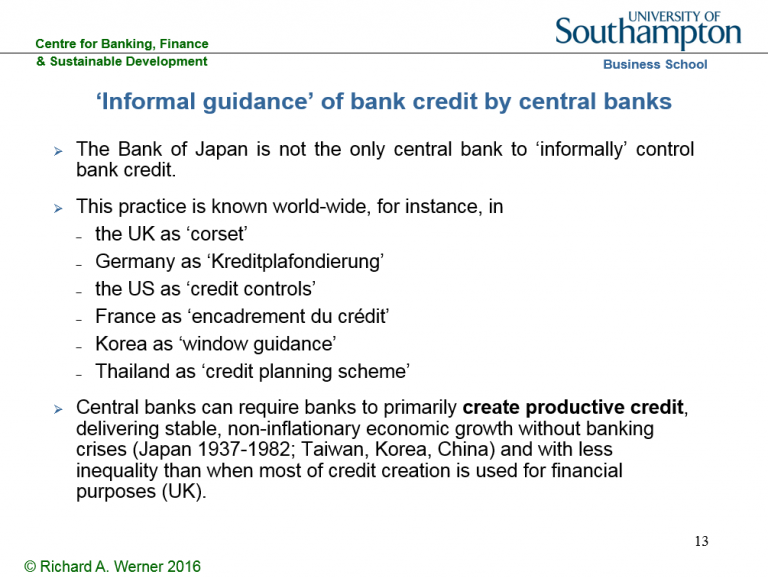 ‘Aspects of Career Development and Information Management Policies at the Bank of Japan – a Frank Interview with a Former Central Banker’, The Japanese Economy, vol. 30, no. 4, New York: M. E. Sharpe. Werner, Richard A. (2004). ‘No Recovery without Reform? An Empirical Evaluation of the Structural Reform Argument in Japan’, Asian Business and Management, 3, no. 1, 2004, London: Palgrave Macmillan.